1972 the rare and hard to find #3210 Montgomery Ward Exclusive Reissue Barbie, who looked very much like the ponytail doll from 1964 (#5) with the same hollow body, little darker skin tone and with the Japan markings was released. Her hair was made with stiffer saran material like the later ponytails. You could only get her with brunette colored hair. There were actually two versions: one with red toe and nail polish (the store version), and the catalog version without polish. 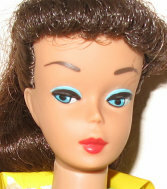 She is marked: Midge™/1962/Barbie®/1958/by/Mattel, Inc./Patented. In the box she came with striped swim-suit, stand (store version only), booklet, and wrist tag. She was released in celebration of Montgomery Ward's 100th year Birthday. She was sold in plain pink box in stores. When ordered through the Wards catalog, she came in a plain brown shipper box. The pink store box read "The Original Barbie". Catalog Version with shipper box, box insert, booklet, and plastic bag.